You can import term sets into the Term Store management tool instead of building out term sets and terms manually. This can save time, especially if there are many terms. To open the Term Store management tool, select the SharePoint environment that you use, and then follow these steps. 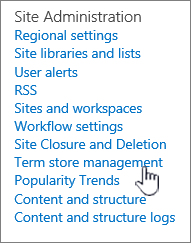 From the site collection Home page in SharePoint Server, click Settings and then click Site settings. In SharePoint Online, click Settings , click Site contents, and then click Site settings. On the Site Settings page, click Term store management in the Site Administration group. After you open the Term Store management tool, you can download a copy of the import file or import a term set. In the Term Store management tool, you can download a copy of a .CSV (comma-separated values) file that you can use to compile the terms in your term set. In the Sample Import section, click View a sample import file on the General tab of the properties pane. Click Save if you get a File Download dialog box, and select the location where you want to save the file. Some browsers will automatically download to a default location, such as Downloads. Each import file can contain a single term set. You can arrange the terms in a hierarchy that is up to seven levels deep. If you want to import multiple term sets, you have to create a file for each term set. Before you fill out the import file, you'll want to give some thought about how you want to group your organization’s metadata into term sets and terms. For more information about how to plan the content of your term sets, see Plan terms and term sets in SharePoint Server 2013. Open the sample import file that you have downloaded in Excel or a spreadsheet viewer. It should have the name ImportTermSet.csv. Study the file to become familiar with the hierarchy of a term set. To add terms, delete all rows in the CSV except the first to create a template, and then enter the terms information that you want to use. Save the file back out as a CSV file. For more info about how to plan to import term sets, see Plan to import managed metadata. For more detailed info about the input file format for term sets and how to fill out the file, see Managed metadata input file format. You must be assigned to a Term Store Administrator or a Group Manager role to import term sets. For more info about managed metadata roles, see Assign roles and permissions to manage term sets. Open the Term Store Management Tool from Site settings. 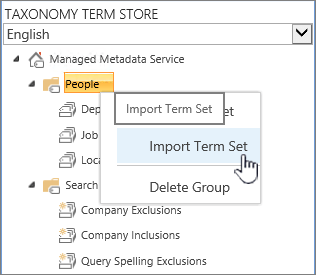 In the tree view pane on the left, expand the groups to find the group where you want to import the term set. Point to the group, select the arrow that appears, and then select Import Term Set. In the Term set import dialog box, select Browse, locate the import file that you have updated with the term set values, and then select Open. In the Term set import dialog box, select OK.